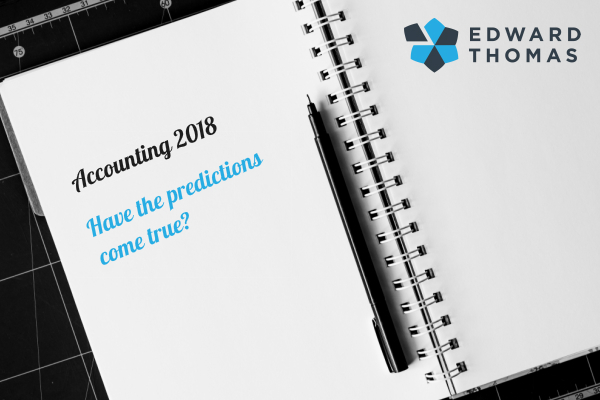 Accounting 2018 – Have the Predictions Come True? Yogi Berra warned us, “It's tough to make predictions, especially about the future.” What were the predictions for the business accounting and how are the meeting the test of time? We'll do an assessment as we head into the home stretch. Revenue recognition guidance adoption will cause implementation of SaaS billing and contract systems to take off. Blockchain will create headaches (and a few opportunities) for accountants across the profession. Multi-factor authentication will (finally) get broadly implemented at accounting firms. Automation, AI, and machine learning will start replacing jobs at the staff level. Accounting teams will have no choice but to go remote to retain the talent. We are now heading into the home stretch of 2018, so we thought we’d revisit these five predictions and see how they’re faring. I have not seen a rapid adoption of SaaS billing or contract systems from the adoption of the revenue recognition guidance. I think this is a matter timing. Larger companies would address this with internal solutions, along with staff and spreadsheets. Many smaller and particularly private companies are still working through the implementation from an accounting perspective and have not yet focused on systems to maintain and support the ongoing maintenance of complying with the new standard. Probably in part due to the crash in crypto currency in 2018, this has not been as visible as it might have otherwise. But blockchain has application and impact beyond the crypto currency. And, it is a technology built to provide security and transactional integrity far beyond existing systems. Crypto currencies will certainly have an impact, particularly as companies raise funds to support the business ideas they are attempting to execute using blockchain technology (think SEC, IRS and accounting implications). But beyond that, the longer run large impact will be the use cases that are being explored, developed and deployed based on Blockchain – many yet to be thought of. Multi-factor authentication is being more broadly implemented more businesses than just accounting firms. And this trend will continue. However, it is a band aid on an inherent structural issue of the internet. Large pots of data tend to collect and be held by large companies. As long as that is the case hackers will hack. Ultimately more sophisticated solutions, many likely to be based on blockchain, will provide true security of data. I don’t see this trend yet. And I think when it does start, jobs will shift rather than be replaced. Technology has consistently replaced jobs while overall jobs and the value of those jobs have gotten better. In accounting, this means clerical drudgery will be done by more automated means and people staff resources will be deployed elsewhere to provide higher value. This trend has been ongoing and it will continue. I don’t see it as a 2018 event. In his article, Oliver Blake suggests that employers will have to become more flexible with employees, for example allowing employees to work from home. I whole-hearted agree with his statement, “Competition for talent will be intense.” Businesses may have to go beyond virtual employees and embrace outsourced accounting. With more Baby Boomers retiring every day, the talent drought will only become more acute. Business owners and entrepreneurs can avoid the disruption and discontinuity of turnover by outsourcing. And, that’s where we come in. Edward Thomas Associates just might be your future accounting department. We can help you prepare for the best future possible – just give us a call.